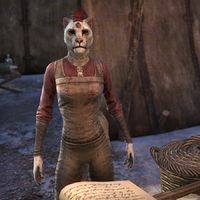 Abandarra-la is a flirtatious Khajiit merchant found at the base camp at Sorrow. When spoken to, she will say, "Is brisk, yes? This one is lucky to have such a sumptuous winter coat!" or "This one does not mind the cold. It keeps the goods fresh, yes?" or "Feel free to examine my goods. Yes, take a nice, long look." or "Alas, this one has no coats to sell—but there are other ways to keep warm, yes?"